On December 26, 2004 the third-largest earthquake (9.5-magnitude) ever recorded jolted India, Indonesia, Sri Lanka and 11 other countries. It triggered a series of devastating tsunamis along the coasts of most countries bordering the Indian Ocean, killing 230,000–280,000 people. Authorities were taken by surprise as the rapidly rising tide devoured everything that came its way, leaving them incapable to prevent human and economic loss. What has been our progress in predictive science and disaster management more than a decade after the tsunami? 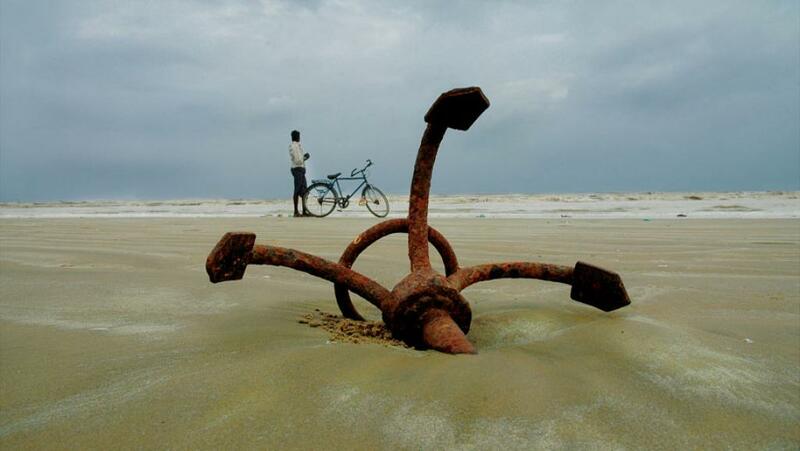 India has been trying to advance its tsunami prediction mechanism and early warning system. Most recently, a network of 35 motion accelerometers and Global Navigation Satellite System (GNSS) receivers were set up on the Andaman and Nicobar Islands. According to media reports, the network will help assess the rupture, area and direction of an earthquake, allowing quick estimation of tsunami and its range. Twelve years after the disaster, bodies of victims still remain unidentified. Around 400 victims of the disaster are yet to be identified in Indonesia. As the world pays homage to those who lost their lives, Down To Earth puts together a series of observations made in the aftermath of the Tsunami. For over five centuries the earth had struggled to maintain its composure, bowing here and bending there, yet somehow withstanding the mounting pressure. 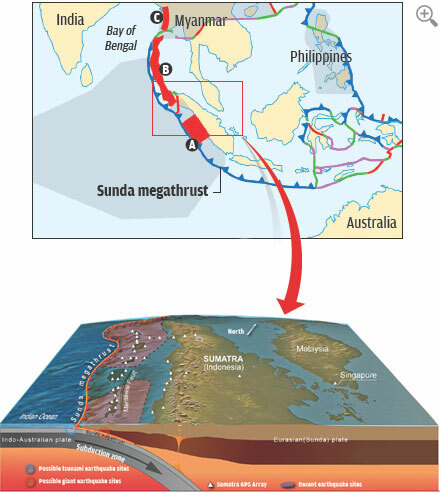 Far beneath the surface, the Indo-Australian tectonic plate was subducting under the Sunda plate, but near the surface these plates had locked together, accumulating historic levels of tension along a huge stretch of the Sunda megathrust. Then, in a decisive moment on December 26, 2004, the earth shrugged off its strain. In a matter of seconds, 1,600 kilometres of ocean floor broke free and lurched upward, like a compressed spring suddenly released. The displacement was later calculated to be as high as six metres. 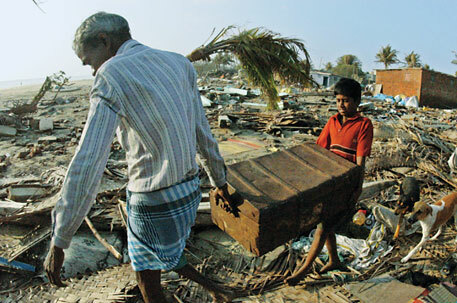 It was this incredible force of displacement that triggered the tsunami of 2004, killing 23,000 people and causing incalculable loss of livelihood. The tsunami could not have been prevented, but it could have been anticipated, and the loss might have been greatly reduced. Despite the uncontrollable chaos we associate with natural disasters of this scale, there are rules and patterns governing even the greatest earthquakes and tsunamis. 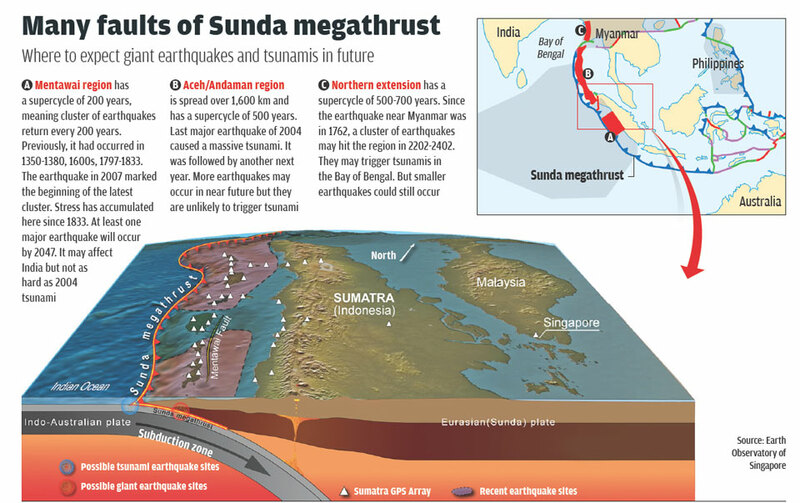 Over the past decade, scientists studying the Sunda megathrust have made great strides in understanding some of these patterns (see ‘Many faults of Sunda megathrust’). The Sunda megathrust, which arcs all the way from Myanmar to Australia hugging the western coast of Sumatra, is replete with seismic activities throughout much of its 5,200 kilometres length. Scientists have long known that the strain accumulated in megathrust faults such as the Sunda are responsible for earthquakes of moment magnitude 9.0 (a measure of total energy released by an earthquake) or higher. But very few earthquakes are that powerful—only five have occurred since 1900; the 2004 earthquake was by far the deadliest one. In 2005 when another earthquake hit the Aceh region of the Sunda megathrust that had ruptured the year before, it was thought to have released remainder of the accumulated tectonic strain in that region. Attention then turned to the portion of the Sunda megathrust just south of the equator, now thought to have the greatest accumulated strain and high earthquake potential. This danger zone lay between the Mentawai islands and the city of Padang in Sumatra. To predict the threat of earthquakes and tsunamis in the Mentawai region, scientists led by Kerry Sieh, director of the Earth Observatory of Singapore, started measuring “uplifted coral micro-atolls” off the Mentawai islands. These micro-atolls are colonies of corals that protrude from the water due to the upliftment of the ocean floor during a major earthquake. The micro-atolls off the Mentawai islands provided an excellent measure of the timing and strength of recent earthquakes, as well as ones that occurred hundreds of years ago (see ‘Coral clock’). Sieh and his team used this coral data to reconstruct the region’s seismic history. And in the process, they noticed an interesting pattern. At the time, it was already well established that powerful earthquakes return in a cyclic pattern. Says Sieh’s colleague, Belle Philibosian, “Tectonic stress on a fault builds up over a long period of time—usually hundreds or thousands of years—before being released in an earthquake, after which stress builds up again and the cycle repeats.” But with the temporal and spatial precision offered by the corals, Sieh and his colleagues noticed an additional feature: during each cycle, a cluster of earthquakes occurred together, much like a series of hiccups, over the course of a few decades. Sieh termed the phenomenon a “supercycle”. “The reason I coined that term is that we had been talking for a century or so about earthquake cycles—about strain accumulation and release. And here we had strain accumulation and partial, partial, partial release,” Sieh told Down To Earth. The prediction is not based on historical precedent alone. In a 2014 paper in Journal of Geophysical Research, Philibosian and her group confirm that the majority of the Mentawai segment of the Sunda megathrust continues to bear significant accumulated stress which could cause a massive rupture at any moment. What matters is the strain that has built up since the last rupture, she says. Several other portions of Sunda megathrust also have significant earthquake potential. Of particular risk to India is its northern extension near Myanmar. There is also evidence of a continued risk of earthquakes in the Acehnese portion of Sunda megathrust that ruptured in 2004, according to a study by Aron Meltzner of Caltech, which was published in Journal of Geophysical Research in 2010. The last great earthquake cluster in that portion probably occurred between 1390 and 1450. The improved understanding of earthquake patterns in the past decade has no doubt enhanced scientists’ ability to monitor and predict earthquakes and tsunamis. 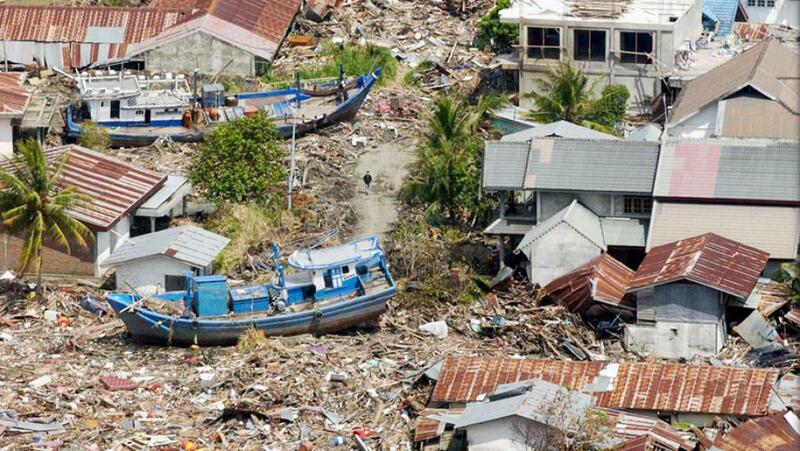 “Virtually all we know of offshore Sumatra (the Sunda megathrust) has been learned in the past 10 years,” says Sieh. The scientific breakthroughs over the last decade have heavily relied on the GPS data combined with measurements of coral micro-atolls. The Sumatran GPS Array has been greatly expanded, from just six GPS stations during the 2004 earthquake to 49 stations now, many of which lie directly above the locked sections of the Sunda megathrust. Countries have also put tsunami warning systems in place. The Indian Ocean Tsunami Warning System, which became active in 2006, may have reduced the damage of the 2012 Indian Ocean earthquakes. In an article written prior to 2007 earthquake, Sieh stated that, “Maintenance of this status quo throughout South and Southeast Asia will prove tragic and expensive, for without strong chains linking scientific discovery to mitigation, other events as profoundly disturbing to human well-being as the 2004 tsunami will strike elsewhere in the coming century.” His words remain relevant today.